The GlenDronach distillery located near Forgue, by Huntly close to Aberdeenshire is within the Speyside whisky district. Founded in 1826 by James Allardice, today it is owned by BenRiach Distillery Company Ltd. The whisky has its own floor malting with two wash still and two spirit stills. GlenDronach core range has purely sherry influence with both Oloroso and Pedro Ximinez. 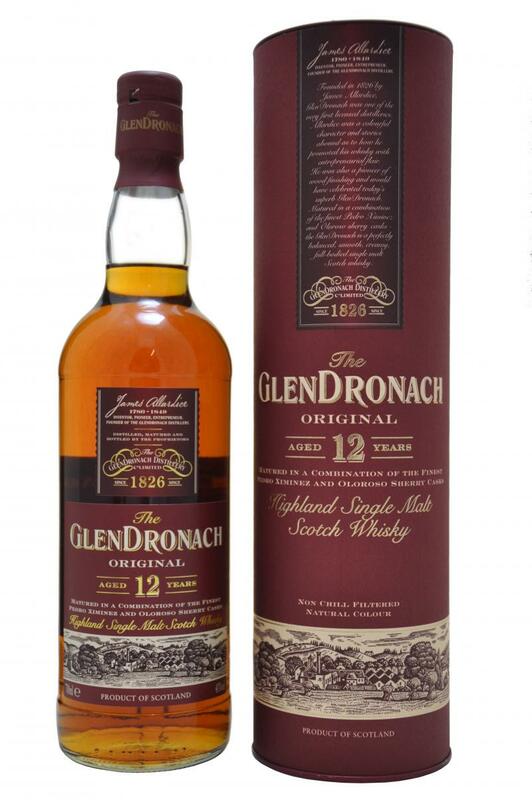 This is the youngest of the core range GlenDronach. The 12yo is matured in a combination of both Oloroso and Pedro Ximinez sherry, bottled non chill filtered at 43%. The nose has a lovely dark honey and a comforting wisp of ginger. The palate is very sherry and raisins like. It has a sharp sweetness to it but doesn’t bite and a smooth creamy texture which stretches quite gently. The finish gives a mild bite to the throat but maintains a gentle flow through leaving a soft numbing sensation at the side of the tongue. The leftover is soft lingering bitter with a nutty tone. whiskytale: You are a petrol head and your garage host a variety of cars suited for different occasions. Owning GlenDronach 12yo is like your everyday city car to run errands. It’s reliable, uncompromising and humble at its task. Like the GlenDronach 12yo, this is the car you normally leave out front for easy access and you know you can hop on its wheels to get from A to B and back safely and without fuss. And when your children finally get their licence to drive, this be their first car you let them drive to ease in their confidence on the road. 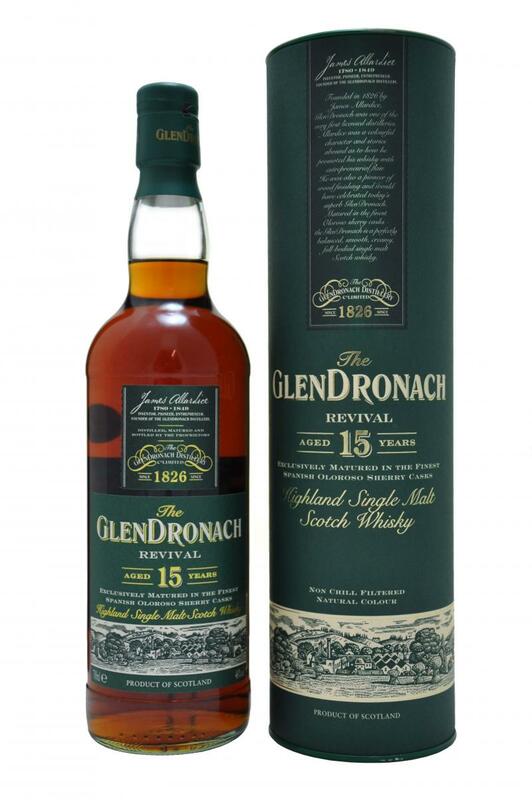 Next in the core range is the GlenDronach 15yo Revival. Unlike its younger sibling, the GlenDronach 15yo is matured in 100% Oloroso sherry cask bottled at 46% non chill filtered. The nose has sweet vanilla, apples, honey and wisp of ginger. The palate is gorgeously sweet with honey and vanilla. It’s gentler to the tongue compared to the 12yo, but does tingle every so lightly whilst creating quite a mouth watering and oily field. The finish is quite swift and comparatively less edge than the 12yo with some nutmeg residue and mild sherry bitterness. whiskytale: Like the gorgeous sweetness in the whisky, this car is made for the eyes to see and heart to indulge with its beautiful sporty curves and design. You can say this is a lady’s car. In fact, this is the only car your wife drives because she loves how it looks and feel. And with the car comes the envy of friends because their wives want one too. With the GlenDronach 15yo, you can serve it to the ladies or men and you are likely to get an almost positive reaction all the time. However, your slightly older friends might find it a little too curvy or rather sweet for their liking. The GlenDronach 18yo Allardice is matured similar to the 15yo in 100% Oloroso sherry cask bottled at 46% non chill filtered. Here, the nose has a sugary fruit cake and honey aroma. After tasting the 15yo, you can’t help but pick out ever so light sherry saltiness but yet still maintains that full-bodied rich fruit cake and tingles at the tip of the tongue. The finish is long, in fact very long and complex, wrapping itself around your throat refusing to let go. whiskytale: It is the weekend and you are itching for an adrenalin rush. Hidden deep in your garage is “Shelby” your high performance sports car. It rarely comes out, always hidden from view, and has clocked less miles than taking your dog for walks. 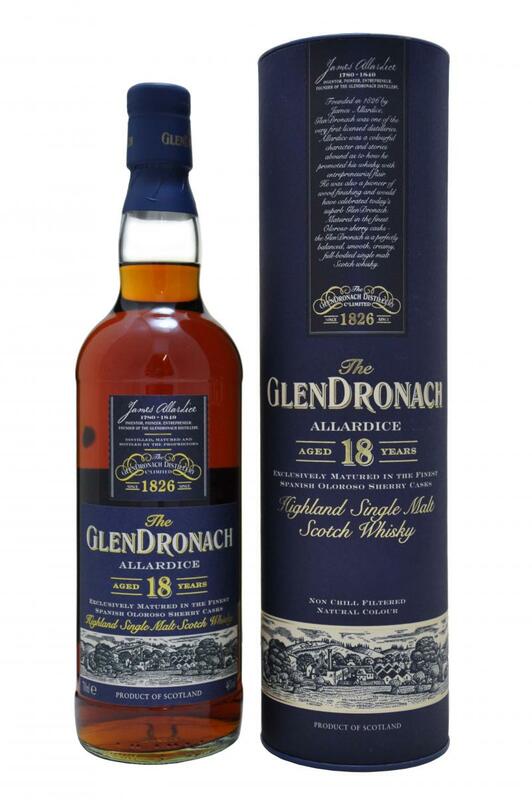 The GlenDronach 18yo makes a great first impression: it is rich, complex and desires attention. You tow Shelby to the driving range and take it for a few laps round the track. You rave at the tug of the throttle and the gush of air in your face, and it leaves an impressionable ringing sound in your ear long after. Like Shelby, you probably wouldn’t drink this whisky every day, but at the same time, you can’t go without having a dram every now and then. 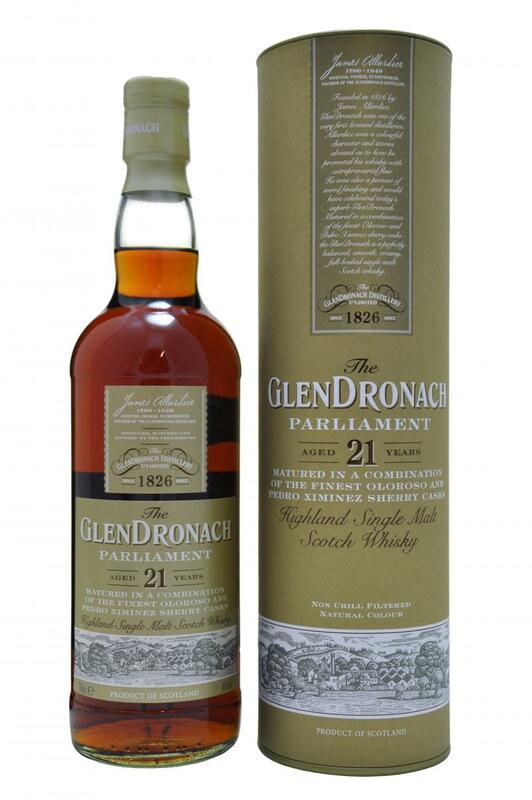 The final core range, the GlenDronach 21yo Parliament is matured in both Oloroso and Pedro Ximinez sherry cask bottled at 48% non chill filtered. The aroma has soft fruit cake and apples with dark honey. The palate is overwhelmingly sweet dark fruit cake and chocolaty. The Pedro Ximinez cask stands out in this whisky. It tingles at the tip of the tongue and stands out as the most full-bodied whisky of the four. It has a punchier finish, the higher alcohol ABV helps with the depth and continues to linger. There is some mild bitter that remains but comforting. whiskytale: The 21yo GlenDronach is your 4-wheel drive. It is not as complex as the 18yo, but still long, it is not as sweet as the 15yo, but still sweet and oh the 12yo will just be overshadowed standing side-by-side. The GlenDronach 21yo is a true gent spirit. Everything about it is in balance; no over-bearing acceleration, proportionate need for speed and a polished ride. Unlikely a young man’s first car of choice, it is most certainly a gentleman’s car however. One would share a dram with their partner or wife, and both would reminiscent great memories driving down the line. I’m going to rename you INdram. I like reading your blog but I have to object to “sherry and raisin like” as a description. You have to be more creative with your language than that.